This article is written to respond to three items posted on the “Fatima Family Apostolate” website operated by Fr. Robert J. Fox. These three items — a “clarification” by the rector of the Fatima Shrine, an article by a so-called “scholar of Fatima,” and a letter from the Vatican nuncio in Washington — were posted by Fr. Fox in an apparent effort to stem mounting criticism of his dogged defense of the recent “interreligious” activities at the Fatima Shrine, which have provoked protests by concerned Catholics around the world. Readers will also recall that during Guerra’s congress — attended by a motley crowd of Buddhists, Hindus, Muslims and Anglicans, as well as Catholics — the participants applauded Father Arul Irudayam, rector of a major Marian Shrine in Vailankanni, India, when he rejoiced that Hindus are now permitted to perform their religious rituals at his shrine. To leave no doubt about the “theme” of this conference, Guerra’s keynote speaker was none other than Father Jacques Dupuis, who was recently disciplined (however mildly) by the Vatican’s Congregation for the Doctrine of the Faith because of the religious indifferentism of his writings, which present all religions as means of salvation. 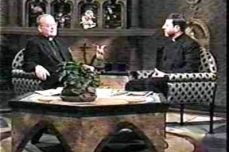 When Catholic Family News and The Fatima Crusader blew the whistle on the outrageous doings at the Fatima Shrine, Guerra erected a public relations barricade from behind which he and his various neo-modernist defenders have been lobbing one desperate grenade after another at The Fatima Crusader’s publisher, Father Nicholas Gruner, and at CFN’s John Vennari. One of Guerra’s chief bomb-throwers has been Father Fox, whose Immaculate Heart Messenger magazine has been anything but immaculate in its nearly hysterical attacks on Father Gruner: “Father Gruner — A Suspended Catholic Priest” screams one of the headlines Fox has published in an effort to divert the public’s attention from what is going on at the Shrine. As this publication has demonstrated time and again, Father Gruner is not “suspended”.3 But, in any event, that is not the issue. Father Fox’s “argument” in defense of Guerra is nothing but a lame ad hominem attack even a child can see is illogical: Father Gruner is “suspended,” therefore nothing is amiss at the Fatima Shrine. Father Guerra said, “The Hindu priest and a translator that he brought with him, went up to the image of Our Lady, while the rest of the group stayed down below.” This is an outright deception. First of all, the Hindu priest did not simply go up to the “image of Our Lady”. After he did this, he positioned himself at the altar that stands in front of the statue of Our Lady. The Hindu priest then used that altar, which he faced, as the place for intonation of his prayer to Vishnu for Shanti, standing in precisely the spot a Catholic priest would stand when celebrating the Novus Ordo Mass. Furthermore, the rest of the group did not “stay down below,” but rather three Hindu women went into the sanctuary, up past the altar, and proceeded to the statue to make their puja (offering of flowers) to “the Most Holy Mother” a/k/a Devi. A Wall Street litigator could not have crafted a more lawyerly statement than Fitzgerald’s loophole-riddled “denial”: As far as he knows the new Basilica is not designed specifically for inter-faith purposes, but Fatima is a place of pilgrimage for many religions (notice how Fitzgerald slipped that amazing bit of news into his remark) although the new structure will “retain” its “Catholic identity”. That a Vatican prelate assures us that the world’s foremost Marian shrine will “retain” its “Catholic identity” is reason enough for alarm. Retain? This is like saying that St. Peter’s Basilica will “retain” its Catholic identity! What a strange thing to say — but how very revealing it is — about a place that could only be Catholic and nothing but Catholic in the first place. No, something was clearly up, but Guerra and his friends weren’t quite prepared to reveal what it was. 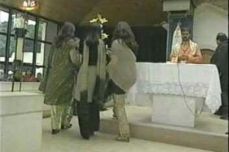 Under mounting public pressure to issue an unequivocal denial that the Fatima Shrine will not be opened to interreligious activity, Guerra told Spirit Daily in January 2004 that “We are very far from having Hindus or any Muslims pray in Fatima, except if they do it in private — not in public liturgies or other services.” Yet another denial that only provoked suspicion. To say that “we are very far” from allowing something is to suggest that at some point it will be allowed. Well, just how far was “very far”? It didn’t take long for us to learn the answer: “very far” meant four months from the time of the Spirit Daily interview! 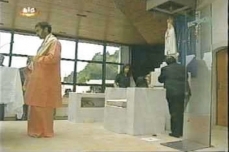 On May 5, 2004 a busload of Hindus, with Guerra’s express permission, arrived at the Cova da Iria, proceeded to the little Chapel of the Apparitions — built on the very spot where Our Lady appeared — and conducted a Hindu prayer service in this Catholic sanctuary. 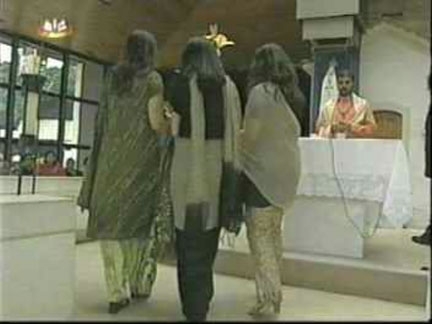 As the coverage by Portugal’s SIC television network showed on camera, a Hindu priest, wearing the vestments of a Hindu priest, went up to the altar in the Capelinha — an altar consecrated for the Holy Sacrifice of the Mass — stood at that altar, and proceeded to intone the Shanti Pa, the Hindu “Prayer for Peace,” for several minutes while the Hindu “pilgrims” sat in the “congregation”. Oh god lead us from the unreal to the real. Oh god lead us from darkness to light. Oh god lead us from death to immortality. Shanti Shanti Shanti to all … etc. — with the “god” in question being Vishnu, “the deity of Shanti.” Vishnu, by the way, has had at least ten incarnations, according to the Hindus. Incarnation #9 was Buddha. Devi is worshiped “during the Vasanta Navaratri. This occurs during the spring.”11 The Hindus at the Capelinha, then, chose a nice spring day for their offering of flowers to Devi. So, to sum up, the Rector of the Fatima Shrine allowed a group of Hindus, led by their Hindu priest, to offer prayers to Vishnu and a puja to their voluptuous goddess Devi in a Catholic sanctuary at a consecrated Catholic altar — on the very spot where the Virgin Mother of the true God came to call for the conversion of the world to the true religion. After this sacrilege had been committed, Guerra, a Catholic priest, allowed a Hindu “priest” to invest him with a Hindu prayer shawl, covered with the verses of a degenerate pagan “bible” whose myths, superstitions and errors could not be further removed from the Gospel. All of this was accurately reported by John Vennari in Catholic Family News and Father Gruner in The Fatima Crusader. In short, Guerra — who assured us that this sort of thing was not going to happen — has been exposed as a liar. And, once again, Father Fox is only too happy to assist Guerra in his continuing attempt to conceal the truth about what Guerra is doing. This brings me to the first item on Fr. Fox’s “Fatima Family Apostolate” website: the latest “clarification” from Fr. Guerra. This is an outright deception. First of all, the Hindu priest did not simply go up to the “image of Our Lady”. After he did this, he positioned himself at the altar that stands in front of the statue of Our Lady. The Hindu priest then used that altar, which he faced, as the place for intonation of his prayer to Vishnu for Shanti, standing in precisely the spot a Catholic priest would stand when celebrating the Novus Ordo Mass. Furthermore, the rest of the group did not “stay down below,” but rather three Hindu women went into the sanctuary, up past the altar, and proceeded to the statue to make their puja (offering of flowers) to “the Most Holy Mother” a/k/a Devi. Tellingly, Guerra had ordered the removal of the locked, bulletproof glass enclosure around the statue (which sits on the precise spot of Our Lady’s apparitions) so that the Hindus could have special access to it. This is done only for high-ranking dignitaries. Guerra deceivingly omits all these facts in order to create the false impression that no altar or sanctuary was involved in this Hindu ceremony, and that only the Hindu priest (and his “translator”) invaded the sanctuary. By the way, the Hindu priest needed a translator because he is from India, and is not a native Portuguese Hindu (of which there are very few, nearly all of them immigrants from Goa). Even on the SIC broadcast, the Hindu priest spoke Hindi and the network provided Portuguese subtitles. For anyone who has seen the SIC videotape, this explanation is ridiculous on its face. When a Hindu priest stands at a Catholic altar and intones a prayer to Vishnu “which lasted a few minutes,” along with an offering of flowers to Devi, and when he does this for the benefit of a group of Hindu “pilgrims” who have come to sit in his congregation, he is performing a Hindu ritual — and he is doing it in a Catholic sanctuary. Guerra’s quibbling over whether some hand gesture was made during this ceremony is an insult to our intelligence. 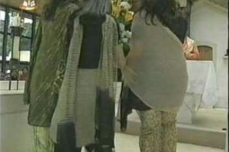 Further, in yet another act of concealment, Guerra omits any reference to the elements of Hindu ritual involved in the offering of flowers to Devi by the three Hindu women who entered the sanctuary. Guerra hides this from the public, and Father Fox assists in the hiding. It must also be noted that, as John Vennari pointed out in his reporting on this incident, the Hindu priest told SIC that he came to the Shrine to take advantage of its “spiritual vibrations.” This is nothing but pagan mystical nonsense which makes a mockery of the Mother of God’s appearance at Fatima to call upon the nations of the world to submit to the Reign of Christ the King and practice devotion to Her Immaculate Heart. For the Rector to allow the Virgin Mary, the Mother of God, to be reduced to the status of yet another Hindu icon, and the place of Her apparitions to be treated as a source of “spiritual vibrations” for Hindus, is an outrage that demands rectification — not to mention re-consecration of the sanctuary and altar which Guerra allowed to be defiled in this way. Does Guerra no longer consider himself bound by the Commandment “Thou shalt not have strange gods before Me”? It is simply unbelievable that Guerra thinks this is a defense of his actions. What it really shows is that under Guerra’s stewardship the Fatima Shrine has become a tourist attraction for the elites of the New World Order, who are treated as visiting dignitaries. Worse, Guerra now reveals that while Hindus are using the sanctuary and altar for prayer services, the Anglicans are being allowed to conduct spiritual “retreats” for non-Catholic laymen posing as priests and bishops of the Anglican “Church”. Does Guerra think God Almighty is pleased when he turns the sacred ground on which His Virgin Mother appeared over to Anglican pseudo-clerics, who spit in Our Lord’s face and re-Crucify Him innumerable times by daring to preach in His name a “Gospel” that condones abortion, contraception, divorce and remarriage, the “ordination” of practicing homosexuals, and various other heresies against His revealed truth? And if the decrepit Anglican “Church” is now allowed to conduct “retreats” at Fatima, who will be next? Will we see Hindu, Buddhist, and Muslim “retreats”? Given what has happened at Fatima over the last eight months should anyone believe Guerra if he denied that he has this very thing in mind? Notice that in the very act of denying that any sort of Hindu ritual took place in the Capelinha, Guerra admits that it was Hindu “pilgrims” who went to the Capelinha with their Hindu priest. That is, the Hindus made a spiritual pilgrimage to a Catholic shrine where they were permitted to offer prayers of the Hindu religion to their Hindu gods, led by their Hindu priest, standing at the Catholic altar — whose use in the ritual Guerra once again conveniently fails to mention. It is hardly surprising that Guerra consistently fails to mention this abuse of a Catholic altar, for the message it sends is loud and clear: that altars consecrated to the worship of the true God in the Holy Sacrifice of the Mass are no longer to be considered sacrosanct, but rather, as a sign of “interreligious” harmony, are to be made available to the adherents of false religions, even at the Fatima Shrine. Guerra craftily argues that the “Hindu pilgrims” he and the Bishop of Fatima received after their “pilgrimage” to the Little Chapel of the Apparitions “did not speak of a similarity or transference between this name (Most Holy Mother) and any entity of their religion.” He does not say that there was no such transference, but only that the Hindus did not speak of it — to him. But they obviously spoke of it in great detail to SIC, which reported what is discussed above: that this was a day for honoring Devi the Hindu goddess. This, no doubt, is why Guerra hedges by adding that “little credit, therefore, should be given to the comparisons mentioned by the media whom we were unable to prepare.” (By “unable to prepare” Guerra obviously means unable to control, so that SIC would not report what the Hindus actually said.) Guerra is being quite careful when he says “little credit” should be given to SIC’s account of the objects of the Hindu worship in the Capelinha, for he knows that SIC was only reporting the Hindus’ own statements. Indeed, how would Guerra know that ‘little credit’ should be given to SIC’s account of the objects of this Hindu worship at Fatima if, as he says in the same “clarification,” the Hindus did not speak to him about which god they were worshiping in the Capelinha? So, Our Lady of Fatima is seen as a “feminine deity” in the Hindu pantheon of false gods. It was this “feminine deity” the Hindus went to “address” in the Catholic Sanctuary of Fatima. This deity, as SIC reported, is Devi. Now, as the Hindu woman told SIC, the feminine deities of Hinduism are always hooked up with male consorts. Devi, so the fable goes, is the consort of Shiva, the god of destruction.12 Such is the pagan idolatry Fr. Guerra welcomed into the Fatima Sanctuary. This text is rife with hints of more outrages to come. Guerra tells us that the phrase “ecumenical temple” is “susceptible of a catholic (sic) interpretation”. Is that so? What precisely is the “catholic interpretation” of an “ecumenical temple”? When in the entire history of the Catholic Church has the Church constructed “ecumenical temples”? We can only imagine what activities Guerra has planned for his “ecumenical temple” which is “susceptible of a catholic interpretation”. If the past several months are any indication, Guerra and his collaborators are just getting warmed up. Guerra says “we do not intend — and have never intended — to hold any celebrations in the church which is being built, that are not in accordance with the directives prescribed by the Catholic Church.” This is not quite the same — is it, now? — as saying there will be no interreligious activities or pagan prayer services at the Shrine. Rather, it is to say that there will be such activities, so long as they are in keeping with unspecified “directives”. Since these same “directives” do not seem to prohibit the interreligious worship services that are occurring all over the world at places as diverse as Assisi, Italy; Glasgow, Scotland; Montreal, Canada and Grand Rapids, Michigan,13 what Guerra is really saying is: there will be more of the same at Fatima. Nor can Catholics take any comfort from Guerra’s statement that the Shrine authorities “cannot help noticing the distinctly Catholic character which the message (of Fatima) inculcates …” That is like saying that Guerra cannot help noticing that the Catholic Church is distinctly Catholic. Guerra is sending the none-too-subtle signal that while he “cannot help noticing” that Fatima is “distinctly Catholic,” this does not mean that Fatima will remain exclusively Catholic — indeed, he has already shown that it won’t, if he continues to be in charge of the Shrine. As far as Guerra is concerned, the Shrine is already open to Hindu pilgrimages, Anglican retreats and whatever else strikes his interreligious or ecumenical fancy. And, as Guerra has already made clear, the practitioners of non-Catholic and even pagan religions can have use of the altar and sanctuary if it pleases them. But there is one group of believers who under no circumstances will be allowed in the Capelinha for their prayers: traditionalist Catholics who wish to assist in the traditional Latin Mass. Hindus, yes. Traditional Catholics, no. This is the upside-down, Through the Looking Glass world of the Novus Ordo Church. The only word for this insane state of affairs is apostasy. That there is only one true religion and one true Church, outside of which no one can be saved, is precisely why the Council of Florence infallibly declared and defined as a dogma of our religion that “not only pagans but also Jews or heretics and schismatics, cannot share in eternal life and will go into the everlasting fire which was prepared for the devil and his angels, unless they are joined to the Catholic Church before the end of their lives.” Guerra’s entire interreligious project, including the address of Fr. Jacques Dupuis denouncing this infallible dogmatic teaching of the Council of Florence as “horrible,” constitutes a public rejection of that dogma. Still worse, Guerra’s turning over of a Catholic sanctuary and altar to the public worship of false gods can only be seen as nothing less than an “abomination of desolation” in the holy place prophesied by Our Lord as a harbinger of the end times. How else can one describe it? Guerra’s own words and deeds convict him. To recall the words of Pius XI addressed to far less egregious offenders, Guerra is guilty of “altogether abandoning the divinely revealed religion.” Guerra thus gives scandal and corrupts the faith of many — including those, such as Fr. Fox, who out of human respect persist in defending Guerra at the cost of their own Catholic integrity. Justice, the common good of the Church, and the salvation of souls demand that Guerra be removed as rector of the Fatima Shrine. And now to the next item on Fr. Fox’s website. Father Fox is so desperate to defend Fr. Guerra’s transformation of the Fatima Shrine into an interreligious tourist attraction that he has also put up on his website a link to an article by one Timothy Tindal-Robertson, whom Fox identifies only as “a well-known author and scholar of Fatima,” but without mentioning his name (which does not appear until the very end of the linked article). Tindal-Robertson takes John Vennari to task for the simple act of reporting what clearly happened at the Fatima Shrine on May 5. But while Tindal-Robertson indulges in a great deal of harrumphing about Vennari’s report, he fails to rebut its basic allegation: that Fr. Guerra allowed access to the Capelinha to a Hindu priest, who offered prayers to Vishnu at the altar, while three women offered flowers to the goddess Devi. CFN’s representative was also refused an interview with the Hindu priest, who said he could not speak without Guerra’s permission. Does anyone smell a cover-up? At any rate, only two sentences later Tindal-Robertson concedes that Guerra’s entire version of the event is set forth in the “clarification” we have just discussed. Vennari had the tapes. Vennari had Guerra’s side of the story from Guerra’s own website. What need was there for an interview? Confronted by the videotaped evidence SIC had provided directly to CFN’s representative, Tindal-Robertson offers the absurd objection that the tape “would need to be verified before it could be accepted as a correct record of the event.” Verified? Was Vennari supposed to subject the tape to forensic testing before he relied upon it? Equally absurd is Tindal-Robertson’s suggestion that CFN’s translation of the Portuguese soundtrack of the video might not be accurate. CFN assigned two translators to the task, and Tindal-Robertson fails to indicate any inaccuracies in the translation or in the video recording. Enough said. Concerning the particulars of the event itself, Tindal-Robertson actually denies nothing. Rather, like Guerra, he tries to put his own spin on the undisputed facts, suggesting (but not explicitly claiming) that “the Holy Mother” worshiped by the Hindus could be, just might be, should be assumed to be, the Virgin Mary, when there is no evidence whatsoever to support this conclusion, but rather abundant evidence on the videotape to contradict it, including the Hindus’ direct statements to camera on their worship of multiple deities. So let us have no more of this nonsense. The Hindus came to the Capelinha as Hindus and they left as Hindus. They did not convert on the spot, become Catholics, and offer legitimate Catholic petitions to the Mother of God. They came to worship a god or a goddess or both. Tindal-Robertson cannot deny that the Hindus did what they did and said what they said to SIC. John Vennari simply reported what happened and drew the inescapable conclusions. Tindal-Robertson knows it, and so does Guerra. Regarding the 2003 interreligious Fatima Congress, Tindal-Robertson says that Vennari made “a number of unfounded and gravely erroneous assertions about the event.” John Vennari responds: “It is amazing that Tindal-Robertson claims I did not accurately report the events at the October 2003 Fatima Congress. He was not at the conference, so he can have no basis for determining whether I reported it truthfully or not. Further, those who were at the Congress never said that my report was inaccurate in any respect. Shrine Rector Guerra, the Bishop of Fatima, the Cardinal Patriarch of Lisbon, the Apostolic Delegate of Portugal — all who attended the Congress, in short — have had every opportunity to note any inaccuracies in my report, and they have noted none whatsoever. Now for the third and final item on Fox’s website. With “denials” and “clarifications” like Guerra’s, and “explanations” like Tindal-Robertson’s, Father Gruner, The Fatima Crusader, John Vennari and Catholic Family News did not have to do any heavy lifting to make their case. All they had to do was report what Guerra said and did and then watch him and his apologists twist themselves into pretzels trying to defend the indefensible. 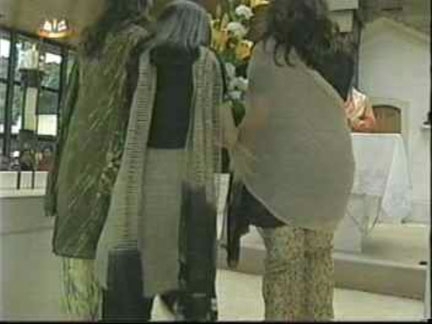 But no matter how hard he tries to cover up for his neo-modernist collaborator at the Fatima Shrine, Fr. Fox only succeeds in providing further proof of what Guerra is up to. 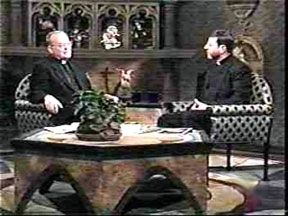 At this point, with his “Fatima Family Apostolate” no doubt being barraged with criticism by its own supporters, it appears Father Fox views yet another ad hominem attack on Father Gruner as the best way to salvage his own waning reputation as a staunchly orthodox devotee of Fatima. As one 13-year-old observer of Father Fox’s behavior has remarked: “Why is he writing to the Apostolic Nuncio in the United States about a priest who lives in Canada?” Out of the mouths of babes. In any case, the gratuitous opinion of the nuncio in Washington that Father Gruner is “not a priest in good standing” is based upon absolutely nothing by way of documentation, or even an explanation of what “not a priest in good standing” is supposed to mean. It is time for Father Fox to stop the cowardly shin-kicking of his fellow priest and confront this issue like a man. Will he, or will he not, defend the sacred ground of Cova da Iria against profanation by pagans, heretics and schismatics? If he will not, then it is time for Father Fox to close down his “Fatima Family Apostolate” and stop holding himself out as a faithful exponent of the Message of Fatima. For if he will not, then Fr. Fox has sold out to the neo-modernist insurgency that has relentlessly compromised the human element of the Church since Vatican II. He has ceased to be “a priest in good standing” in the only sense that matters: not good connections with the current ecclesial bureaucracy, but fidelity to the Roman Catholic religion — the faith of our fathers. See “Fatima to Become an Interfaith Shrine? An Account From One Who Was There”, Catholic Family News, December, 2003. See “Fatima Priest Not Suspended”,Catholic Family News, November 2001. See also “Actually, Virginia, Father Gruner is Not Suspended” here. Communiqué from Guerra. December 28, 2003. “Pictures of a Desecration”, Catholic Family News, June, 2004. The Complete Idiot’s Guide to the World’s Religions, p. 127. 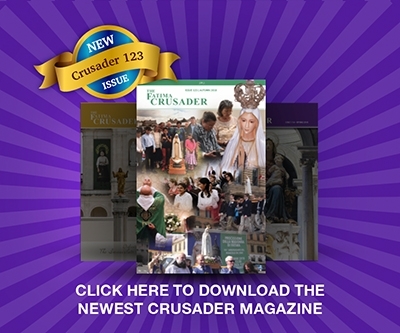 See “The Pagan Invasion of the Catholic Church”,Catholic Family News, August, 2004. Pope Saint Pius X, “Our Apostolic Mandate”, August 25, 1910. Pope Pius XI,Mortalium Animos, “On Fostering True Religious Unity”, January 6, 1928. This was done in conjunction withThe Fatima Crusader. As we go to press, this recording is now being finished. It is called the “Desecration of Fatima” and is available on cassette or CD for a low price of $3.00 US post-paid. Order from: Oltyn Library Services, 2316 Delaware Ave., PMB 325, Buffalo, NY 14216. For photographic reproduction of these letters, see “Father Fox’s Modernist Assault on Fatima”, Special Supplement in the issue ofCatholic Family News.